I'm a year late to the party, but I finally had a chance to play Bastion. My only regret is that I waited so long; it's one of those games that feels like it was made specifically for me. I'll probably share some more detailed thoughts in the future. For now, I wanted to highlight a few of lessons I hope people take from Bastion. "In the history of Caelondia, no one's ever volunteered for another shift on the Walls. Out there, the Kid learned to fend for himself. Learned to build. Learned to break. From this, we get a sense of the hardship of serving in Caelondia's military, as well as the possible existence of a social stigma attached to those who serve. We learn about the Kid's journey and how he became such a proficient soldier. After experiencing the Kid's fighting skills first hand, we know that the process of "learning to break" involved more than just smashing crates. The Kid had to break the wilderness; he had to break the uprisings; he had to break away from his youth. The story is told while you play the game, not while you are waiting to play. Listening to Ruck's raspy drawl while my frantically dealing with hordes of enemies kept my brain working in more ways than one. Additionally, hearing the narration adapt to my actions and weapon choices was an incentive to avoid getting into a gameplay rut. Bastion doesn't shy away from traditional brawler dynamics for the sake of its story or physical realism. On the contrary, the game encourages you to exploit action priorities by cancelling out of animations or dashing before an attack has fully completed. The constant barrage of various enemies and the many options of dealing with them makes the game feel like a modernized version of Golden Axe or Secret of Mana. Ultimately, everything comes down to your ability to dodge, block, and attack, but the different weapons drastically alter the balance between these three actions. I found it hard to part with my trusty melee hammer, but once I forced myself to learn how to best use the rifle I never wanted to let it go. Finally, Bastion has an extremetly elegant approach to game difficulty. Players looking for a challenge can opt to turn on idols that make battles more dangerous; some make enemies move faster or explode upon defeat while others cause random status effects. This is both more creative than simply cranking up the damage values or adding more enemies, as it actually alters the way you have to play, thereby teaching you new techniques. Additionally, activating idols also increases the amount of money and XP you gain from enemies. It's a great difficulty loop, as it serves players who are actively looking for a challenge, lures players on the borderline with incentives to increase their skills, and stays completely out of the way of those who aren't interested. This scalability makes the prospect of jumping into Bastion's New Game Plus mode that much more enticing. After finishing the game, new challenges and rewards await, as do new narration dialog and story decisions. The depth to which Bastion's plot and game dynamics are revealed is left largely up to the player's discretion. 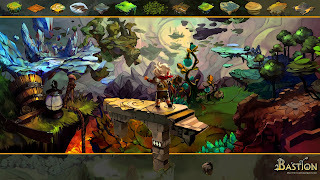 Whether you're looking for a casual beat 'em up, a challenging action experience, or a cautionary tale about imperialism, Bastion invites you to make yourself at home.